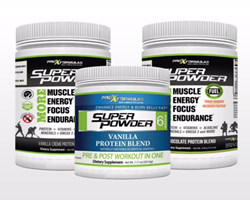 Super Powder, a supplement produced by Prox Formulas for providing protein and other essential nutrients to on the go individuals and dedicated athletes, continues to transform the nutritional supplement industry by providing a safe, natural approach to enhanced body functions. Loaded with whey, pea and milk protein, branched-chain amino acids (BCAA), alkaline minerals, wheat grass, digestive enzymes, Omega 3’s, Vit D3, Vit A, B1, B2, B6, B12, C, E, and Calcium, Super Powder leaves athletes and patients with everything they need to endure their rigorous, demanding daily schedules. Regimented ingestion of Super Powder can be incredibly beneficial and substantial for individuals. The unique, all-encompassing composition eliminates the need to take any other supplements or pills throughout the day. Additionally, its organic composition makes it a safe, sustainable energy booster for any individual. Super Powder has been tested safe for NCAA and pro-athletes and contains no banned substances. Additionally, it is free of dangerous artificial sweeteners, like aspartame and sucralose, and is naturally flavored with stevia, monk fruit, cocoa powder, creamy vanilla and chocolate. For more information, visit: http://proxformulas.com/. Formulated by Dr. Ed Esposito, Super Powder is loaded with whey, pea and milk protein, branched-chain amino acids (BCAA), alkaline minerals, wheat grass, digestive enzymes, Omega 3’s, Vit D3, Vit A, B1, B2, B6, B12, C, E, Calcium, it provides instant energy naturally and helps to replace lost minerals and protein.